Place Dauphine: a public square, actually triangular in shape, located in the Île de la Cité in the first arrondissement of Paris,. Initiated by Henry IV in 1607, was named after his son the Dauphin, the future King Louis XIII. 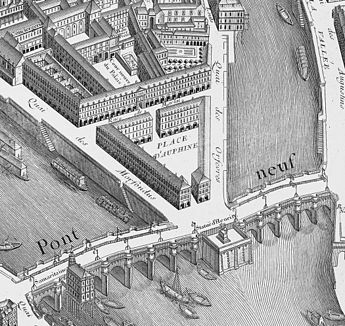 The entrance on the middle of the Pont-Neuf has not changed since.